My mom, Clida, taught my four brothers and me about her father’s work to organize Black voters in rural Louisiana in the 1950’s. We carried her dad’s legacy of activism with us. The Civil Rights Movement was present in the daily life of my family in Detroit in the 1970’s. I’ll never forget working to get my college, Wayne State University, to divest from the government in South Africa. This was the beginning of my activism, and the fight for social and economic justice has been a constant thread in my life. My activism led me to toss my hat in the ring for DNC Chair, where I will work to reclaim our history as the Party that stands with working people. Unfortunately, some political opponents continue to distort my record based on an old right wing smear campaign — not my work in Congress, or my vision for the future of the Democratic Party. Go back 25 years to 1991. Cameras recorded the brutal beating of Rodney King by Los Angeles police. Unemployment for African Americans was 13% and the war on drugs was driving up incarceration rates. 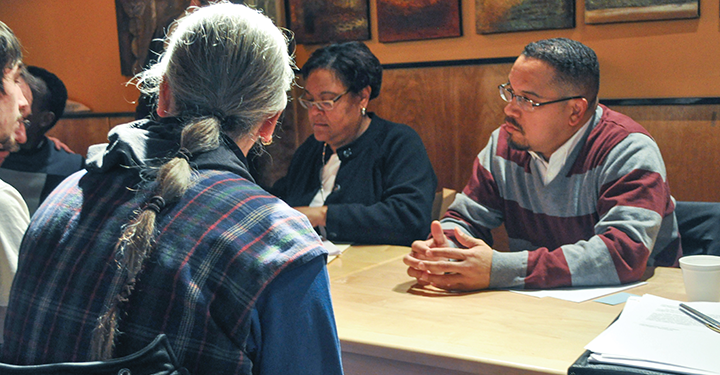 I was working with young people in my neighborhood of North Minneapolis and saw the challenges they experienced while looking for a job or trying to rent an apartment. I was a young lawyer hoping to bring more fairness to the criminal justice system. And I was trying to help folks in the community organize for a better quality of life. I saw the Million Man March as a positive effort and I helped to organize a group from Minneapolis to attend. Like many young African-American men at the time, including President Obama, I hoped the March would promote change in our communities, and I was proud to be part of it. Civil rights leaders, ranging from Rosa Parks to Jesse Jackson, and artists like Stevie Wonder and Maya Angelou, supported and spoke at the event. Of course, a huge number of Black men — some counts as high as one million — showed up as well. My values — going back to my childhood — were always based on respect for all people and rejection of bigotry and racism. When I first heard criticism about Louis Farrakhan, the leader of Million Man March, I felt the March’s message of empowering young African Americans was being attacked. But I clearly didn’t go deep enough. I defended the organizer of the March in writing, but I glossed over the hurtful and divisive language he directed at other communities. In my effort to pursue justice for the African-American community, I neglected to scrutinize the words of those like Khalid Muhammed and Farrakhan who mixed a message of African American empowerment with scapegoating of other communities. These men organize by sowing hatred and division, including, anti-Semitism, homophobia and a chauvinistic model of manhood. I disavowed them long ago, condemned their views, and apologized. I have always lived a politics defined by respecting differences, rejecting all forms of racism and anti-Semitism. A politics based on inclusion, and diverse communities organizing together for economic justice for everyone. I started listening a lot more. Throughout my work as a state legislator and Member of Congress since 2002, I have worked as hard as I could to build bridges. I’ve worked to combat anti-Semitism and confront Holocaust denial. I’ve organized dozens of meetings to promote interfaith dialogue and joint projects. I’ve stood up for religious freedom and human rights for people of all faiths. I have built coalitions to increase accountability for hate crimes against all communities. If we are going to move the country forward, we need an agenda that brings working Americans together — not one that scapegoats our neighbors because they pray to a different God or their skin is a different color. My early work as an organizer helps me connect with today’s activists and helps them see that electoral politics is a vehicle for change, not a system to be shunned. As Democrats we want the millions of young activists — the Dreamers, Black Lives Matter, young labor organizers, environmentalists and everyone — to see the Democratic party as the place where they can organize for a better future for their families and neighborhoods. Their vision and energy is essential for our future. In the face of a President-elect who seeks to pit working people against each other, we need a movement that unites Americans behind a core set of goals. We can stand for better wages, fairer trade laws, and dignity in retirement, without demonizing religious or ethnic minorities. That’s why over 100 Democratic leaders — including Senator Chuck Schumer, Representative John Conyers, Senator Elizabeth Warren, Mayors, State legislators and State Party Chairs — have joined this campaign to renew and build an inclusive Democratic Party for the future. In order for our party to heal the wounds of this past election, we have to energize working people across this country. That’s what the Democratic Party should stand for, and that’s what I hope to do as the next DNC Chair. Peace, prosperity for working families, environmental sustainability, and support for civil and human rights.